L. Brad King’s prototype of a ferrofluid ion thruster. When subjected to voltage, the points of the crown arise from a ring-shaped trench circling a 2.54 cm block of aluminum (Credits: Sarah Bird). At a fraction of the volume and mass of traditional satellites, nanosatellites hold distinct advantages over their larger cousins, such as low launch cost and mass producibility. Most space agencies around the world have recognized that nanosats have excellent scope in future. Due to their small size, nanosats can be built with cameras and GPS systems of existing devices such as cell phones. Such devices have advanced components, which have been perfected for use on Earth, and can also be utilized in space. The biggest challenges for nanosats lie in the area of propulsion and attitude control. Sophisticated Attitude Control Systems (ACS) require complex mechanisms which can’t be scaled to fit on nanosats, hence existing ACS for large satellites can’t be utilized in nanosats. One approach under extensive research is the area of building microscopic needles to spray thin jets of fluid, which push a satellite in the opposite direction. The needles spray a propellant known as ionic liquid; this needle is finer than a human hair. To maneuver a nanosat, a few hundred of such needles are required, all of which may fit in a postage stamp sized package. Due to their very small size, producing the needles is a huge design challenge. Ferrofluid in action: A puddle of ferrofluid sitting on a small, permanent magnet. 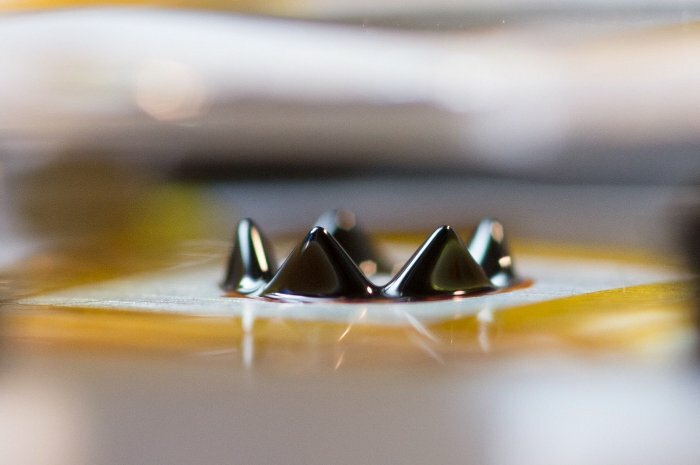 Ferrofluids are made with tiny magnetic particles that form uncanny shapes that seem to defy gravity when interacting with a magnet (Credits: Sarah Bird). “Because they are so small and intricate, they are expensive to make, and the needles are fragile,” said King. The fascinating self-forming ferrofluid thrusters are still under development, and not yet ready to be fitted on nanosats. “First we have to really understand what is happening on a microscopic level, and then develop a larger prototype based on what we learn,” said King.